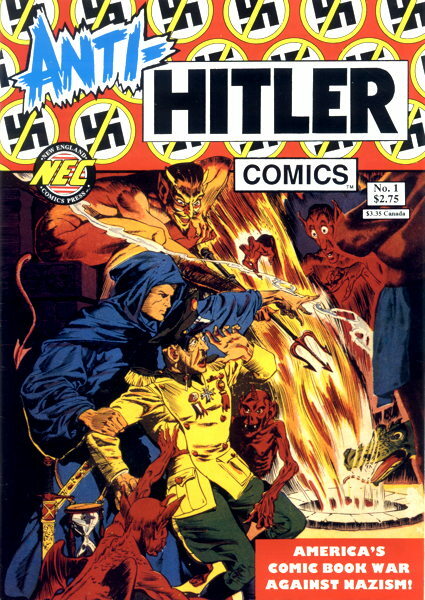 Anti-Hitler Comics #1 (Summer 1992). For a while there, New England Comics (the publishers of The Tick ) were releasing several reprint series of Golden Age-era stories…mostly forgotten, probably public domain, and almost entirely strange. The longest running, and, for my money, the best of the bunch was Tales Too Terrible to Tell , a fat ol’ comic stuffed with terrible stories that, despite the title, they were telling anyway. Most issues of this and the other reprint books included copious historical notes about the publishers and the stories themselves. The reprints are all black and white, and reproduction is usually pretty good, depending on the source material they’re using…there’s the occasional muddy page, but if you don’t like it, go buy your own copy of the color original, effendi! That awful feller Hitler gets what’s coming to him in the stories within, generally involving him being in Hell, and, y’know, good riddance. My main memory of actually having this book on the new comics rack at the time was the fact that the blue “Anti-” in the logo didn’t immediately register with people on first glance. The first thing a customer would see upon browsing the shelves were the big bold ‘n’ black words “HITLER COMICS” which, as I recall, elicited a comment or two. I would respond “Anti-Hitler Comics, ANTI!” and they’d look again and go “ooooooh, okay.” The little yellow slash symbols over the swastikas didn’t really come across at first glance, either…maybe it’s the fault of the cover design, or maybe it’s just that things like swastikas and the name “Hitler” cut through whatever attempts you can make to, um, soften the blow, I guess. That’s a great splash page which was probably something to behold in color…and the rest of the story suffers a bit by not being in color. The small-ish panels are filled with highly detailed but somewhat confusing activity that could have used a little color to make the action a tad more clear. (I, an effendi, should apparently go buy my own color copy of the original!) 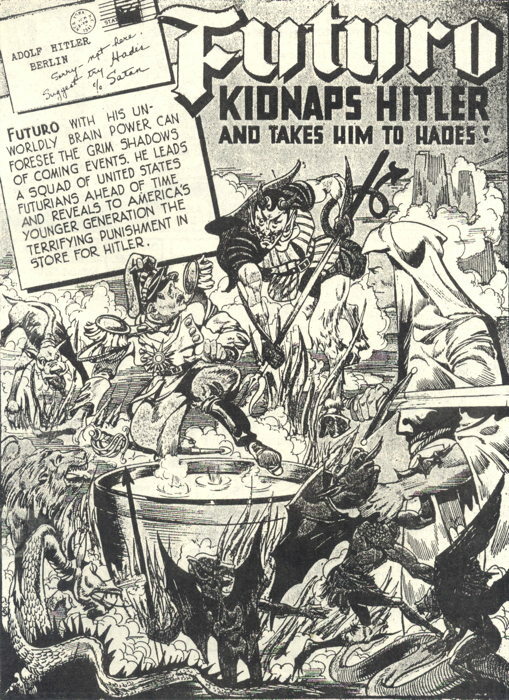 Anyway, Hitler is shown being shuttled from one punishment to the next, while Futuro tries to stop Hitler and Satan from teaming up to defeat him…and, well, as the text pieces note, this was published right after America entered the war, and the creators apparently felt they couldn’t just outright kill off Hitler since in the real world he was going to continue being an ongoing problem. It was enough that the story promised its readers that Hitler would get the punishment he deserved someday, either in this world or the next. The second untitled story (save for the name of the story’s hero, the Unknown Soldier…not the DC Comics guy) is a little more peculiar, in that Hitler is presented as being Satan himself, who pops up to offer a solider, George Smith, safety and heroism in battle now, in exchange for his soul later. The Unknown Solider uses his supernatural powers to attempt to intervene, while Hitler/Satan allows George his moments of heroism, only to instill cowardice in him later after removing his soul to undermine the troops’ morale. Hitler/Satan of course gets his comeuppance, as George regains his bravery after speaking to spirits of fallen heroes, and sacrifices himself in battle…stopping a German advance and freeing his soul from Hitler’s grasp. These are a couple of nice, little-seen examples of wartime propaganda comics, and it would have been interesting to see what more the editors of this series had available. Alas, though a second issue was promised on the back cover, it never appeared. But if you need more anti-Hitler (or just anti-Nazi in general) funnybookin’, let me direct you to this Twitter hashtag. Very timely. And more of an anti-Nazi stance than even our president is able to muster. Nice work!